This part of the Web site is for all the tortoise people out there. You can tell your best tortoise story, share a great picture or video, or ask a question about tortoises or turtles. We tortoises are dignified. But we also have a great sense of humor. When you have a funny story to tell about one of us, post it on this Web site. Sometimes we show off for you. You can write about how amazing the tortoise at your house is, and everyone will know how smart you were to choose to live with a tortoise. Maybe you don't live with a tortoise or turtle, but you have met some of my relatives in the wild. Maybe you have questions about who you met. I'm still very young and I'm still learning about my heritage and my family, but lots of people visit this Web site, and they can answer your questions even if I can't. We can all get smarter together. Ask your turtle or tortoise question here. You can admire all the tortoises and turtles in The Brag Book. You can even write comments about them yourself. 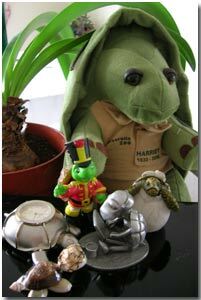 If you are smart about tortoises and turtles, you might find some questions to answer. This whole section of my Web site is for YOU! So enjoy!